Marie Ringler, presenting Ashoka. Michael from The Good Tribe listening. Photos: The Hub Vienna. 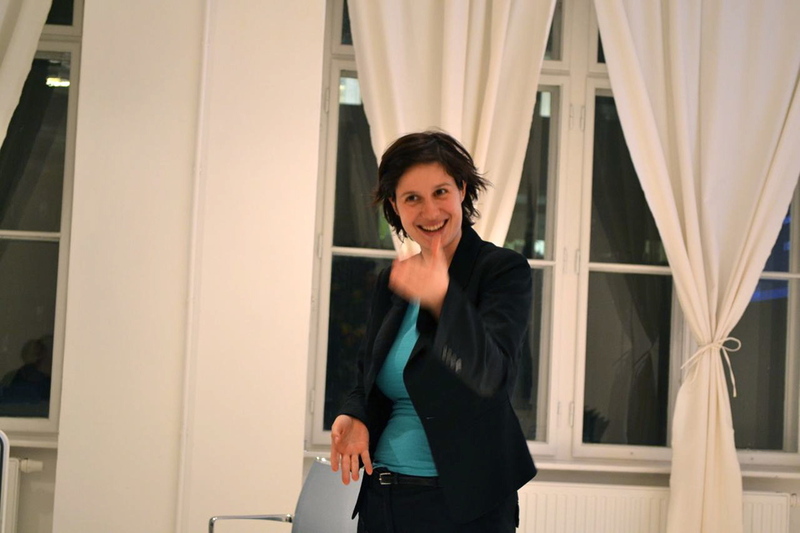 Last Monday, March 14th, I had the chance to listen to and discuss with Marie Ringler, country director of Ashoka’s Austrian chapter, at The Hub in Vienna. The Hub invites interesting people to present their insight under the label “Meet the Investor” every month, and this time it was Marie Ringler and Ashokas’s turn. Founded 30 years ago by Bill Drayton, Ashoka today gathers roughly 3000 social entrepreneurs globally under one roof. The Austrian chapter was established at the beginning of 2011. Ashoka’s ongoing global quest is to “turn everyone into a change maker”, as Bill Drayton puts it. Many perceive social entrepreneurship as a somewhat grey area – Evelina and I have gained this understanding also when interviewing business angels and social entrepreneurs for our study. Ashoka, though, employs a simple yet smart view of social entrepreneurship. No wonder after 30 years of experience, one might add. According to Ashoka, a social entrepreneur is a person who solves a social problem at its root using entrepreneurial techniques. So it’s not about giving blankets to the homeless, but empowering them to get a home by themselves. It’s about the resolution of problems societies face today, no matter whether these are problems of social or environmental nature, using new, innovative ideas that ideally carry global up-scaling potential. Looking into Ashoka’s history and recent numbers, it seems to be the bridging function to the business world that makes Ashoka and the social entrepreneurs in the network successful. It lets become social activists social entrepreneurs. Not only do social entrepreneurs – from Ashoka’s point of view – employ well-known and proven methods and instruments from economic theory to transfer an idea or social activity into a social venture, but conveying new concepts and ideas with proven methods is a powerful means to convincing people that it can work out. There’s, however, this big hurdle social entrepreneurs have to overcome, which is finding financing to grow their ideas. The market for social investments – especially in Austria – develops only very slowly. Drawing from experience of the participants we interviewed for the study as well as the impression Marie has, this market is strongly askew. Also attending Annunziata Schmidt-Chiari of good.bee, the microfinance and social entrepreneurship initiative of the ERSTE Foundation and the Erste Group Bank AG, supports this view. Huge demand on the social entrepreneurs side faces very little supply from investors. This suggests giving rise to an imbalance of power. Referring to Michael Porter’s five forces, supplier power in this market seems overwhelming. We hope, though, that we can contribute with our study to finding ways for social entrepreneurs getting better financing and such helping to move closer to market equilibrium. What do I take away from this interesting evening with Ashoka Austria? It’s the combination of good and powerful ideas of passionate and integer people catering to societal demands and proven economic principles that fuels global system change. And if you make a profit, good for you! Take what you need to make a living, and put the rest to work for maximizing social impact.